From the beginning, this value served as a central force in igniting and driving transformation, and it continues to inspire and motivate the people and processes involved in this fundamental realignment of systems and services. Many partners in this movement report that much of its success is due to passionate, committed, and meaningful effort by people with lived experience of mental health and/or SUD challenges and recovery. 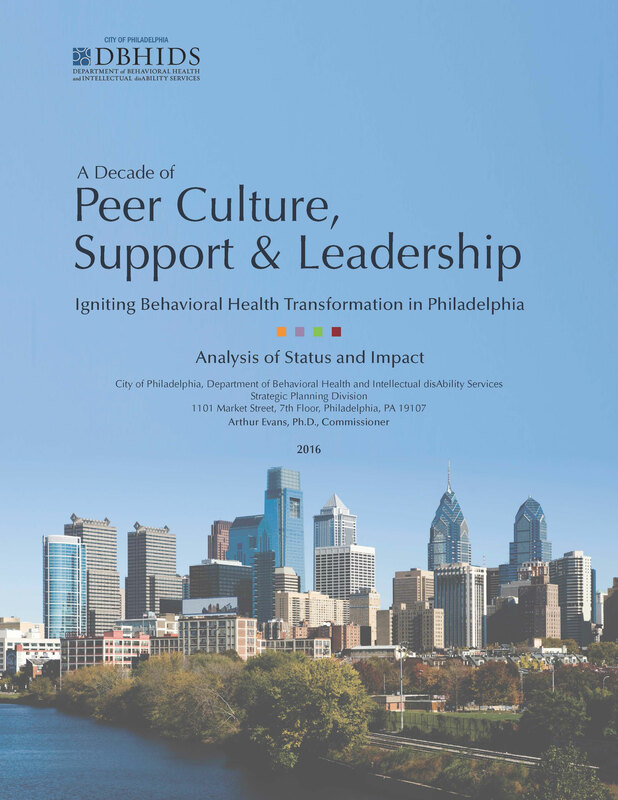 In 2015, DBHIDS decided that the future course of this core element of transformation would depend very much on its past and its present, so a review of the status and impact of peer services would be necessary, and commissioned the publication of a report, A Decade of Peer Culture, Support and Leadership: Igniting Behavioral Health Transformation in Philadelphia. This report reflects the findings of that review. Much of what informed the early stages of the transformation process in 2005 was gathered through a system-wide “asset-mapping process,” designed to assess the progress and performance of the system and to establish the future course for systems change. 3. determine the direction DBHIDS and stakeholders should take to keep their efforts true to the spirit and principles of peer culture while they move toward a re-imagined future. Further discussion of the context in which transformation has taken place and the purpose of the 2015 asset mapping process is presented in Section I, the Introduction. Focus groups and surveys were used to assess the strengths and challenges of this 10-year implementation and gather input for future directions. The methods used to conduct these processes are presented in Section II, their results are presented in Section III and discussion follows in Section IV. This report is designed to inspire and inform a level of discussion and collaborative effort that will move this work forward in ways that honor both the tradition of ROSC transformation in Philadelphia and the fundamental importance of peer culture, support and leadership.